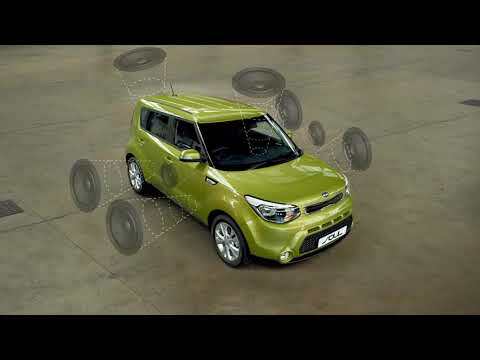 The Kia Soul range consists of five stunning models - Including; ‘Start’, ‘Connect’, ‘Connect Plus’, ‘Mixx’ and the top of the range ‘Maxx’. The new range has been rejuvenated and refined – inside and out – with dynamic muscular styling, plenty of cutting-edge technologies and an even more engaging ride. The Soul is highly alluring and truly embodies Kia’s ‘power to surprise’ - take a look at the sleek black high-gloss and chrome ‘tiger nose’ grille which features on the Connect’ upwards. Complemented by the lower front grille which has a sharper and more aggressive style. The Brand New Crossover design is created by robust wheel arches, a distinctive wrap-around glasshouse and cool alloy wheels. ‘Start’, ‘Connect’ and ‘Connect Plus’ feature multi focus reflector headlights including daytime running lights which significantly improve your visibility to oncoming traffic and ‘Connect’ models upwards also boast front fog lights and the convenience of electrically folding door mirrors with LED indicators. Need more information? Download and view the latest Kia Soul PDF brochure. Kia Soul price starting from just £14,725 and available to buy from Underwoods - Kia Main Dealer in Colchester, Essex. Take a look around the aKia Soul and you will find a wealth of eye-catching design features. The Soul has been designed with lower, wider and distinctive profile and stance, the design of the Soul is a bold and impressive statement. Electric folding door mirrors with LED indicator lights feature on the ‘Connect’ upwards. These models feature the convenience of electrically folding door mirrors and stylish LED indicators. On the ‘Mixx’ and ‘Maxx’ versions the stylish LED daytime running lights significantly improve your visibility to oncoming traffic and the newly designed LED rear combination tail lights which combine outstanding visibility with sophisticated style and enhance visibility to traffic behind the car. These models also include stylish privacy glass which further enhances the exterior appeal of these models. The Kia Soul takes interior quality up to a different level. The unique circular styling theme includes the steering wheel mounted controls which ensure you stay focused on the road by operating the audio features safely without the need to take your hands off the wheel, a cruise control and speed limiter feature (‘Connect’ upwards) which allows the driver to better control their speed and spherical high-mounted “floating” tweeters – they all come together to create an organic, fresh appeal. All you need to do is add your favourite tunes. The Soul boasts a multiple amount of superb standard features including a leather trimmed steering wheel and gearshift on the Connect model and upwards,a handy tilt and telescopic steering wheel adjustment. Steering wheel mounted controls make it easy to access the Bluetooth® with voice recognition and music streaming feature (‘Connect’ upwards) which can be used to make calls and play your music wirelessly. A trip computer provides useful information about how many miles to empty, average speed, drive time and average fuel consumption, whilst the cruise control and speed limiter feature on the ‘Connect’ upwards allows the driver to better control their speed. The infotainment comes courtesy of a high-tech instrument cluster has been re-designed with recessed gauges and a good size highly visible 4.3” colour TFT display which provides a wide range of useful vehicle information. When you take a look around the Kia Soul you will find a wealth of eye-catching new design features. The design of the Soul is a bold and impressive statement and has been designed with lower, wider and distinctive profile and stance. The Kia Rio comes with electric folding door mirrors and LED indicator lights feature on the ‘Connect’ upwards. These models feature the convenience of electrically folding door mirrors and stylish LED indicators. On the ‘Mixx’ and ‘Maxx’ versions t he stylish LED daytime running lights significantly improve your visibility to oncoming traffic and the newly designed LED rear combination tail lights which combine outstanding visibility with sophisticated style and enhance visibility to traffic behind the car. These models also include stylish privacy glass which further enhances the exterior appeal of these models. The versatile Soul range has room for adventure, boasting plenty of load space and flexibility. The rear seats are 60:40 split-folding to allow for various seating configurations and provide an impressive 994 litres of load capacity with the rear seats folded down and 354 litres of loading capacity with all seats in place. The opening width of the boot is 52mm wider than its predecessor which makes loading items into the boot far easier. ‘Mixx’ and ‘Maxx’ models also have a useful luggage under-floor tray which makes storing items underneath the luggage floor more convenient. These models also have a power outlet and handy, portable rear LED light located in the boot. Designed to provide a supple yet controlled ride, the suspension of the Soul has been tuned on European roads to ensure it can cope with the harshest of road surfaces. As a result the range offers excellent stability, taut but agile handling and a quiet ride. In addition the aerodynamics of the Soul have been improved. Engine and centre floor under covers have also been added to further improve the overall aerodynamics resulting in a lower drag co-efficient. Whether you’re touring country roads or cruising city streets the Soul’s 1.6 litre petrol or diesel engines will get you there effortlessly by providing a responsive and smooth driving experience. All Soul models are paired with advanced 6-speed transmissions. Choose between the 1.6 litre Gasoline Direct Injection (GDi) 130bhp available with manual transmission or the 1.6 litre (CRDi) diesel 126bhp which is available in either manual or automatic transmissions. 6-speed manual transmission featuring enhanced shifting performance, fuel efficiency and durability, this gearbox also provides a more engaging drive. 6-speed automatic transmission, a compact, lightweight transmission offers durability and smooth shifting, as well as an ergonomically positioned manual mode.